Slick animation, interactive characters who shape the action on the reels, and interesting bonus features - slot developer Betsoft Gaming are back on form (although were they ever really off it?) 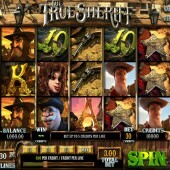 with their Wild West-themed slot, The True Sheriff. A 5-reel, 30-payline game, The True Sheriff is set in a Wild West complete with saloons, gunslingers, revolvers, buxom bar wenches and town mayors, together with some nice nickel-plated 10-through-Ace card symbols. Over the top is some nice Western-style sound FX, complete with coyotes and tweeting birds, and a delightfully dusty atmosphere overall. Look out for the gunslinger on the side of the reels. He's not just there to applaud you when you hit a winning combination; he also helps you win more Wilds as you play the game. Hit the Gun symbol on the middle reel only and our sharp-shooting, rootin'-tootin' pal will fire shots at the reels, turning every icon he hits into a Wild. Those Wilds then stay put for the following spin, potentially giving you some big wins. I found a few times that he hit a Wild on every reel meaning that I was hitting 5-of-a-kind on every subsequent spin - sweet! There's one more bonus round to be had - the Showdown Feature - which is activated when hitting the Gun icon inbetween our hero and the moustachio’d baddie on Reels 1, 2 and 3. Here, as in Play ‘n’ Go’s Gunslinger game, which this is similar to, our hero fights it out with the bandit to see who is top dog. There are six rounds to fight through en route to the big prize. 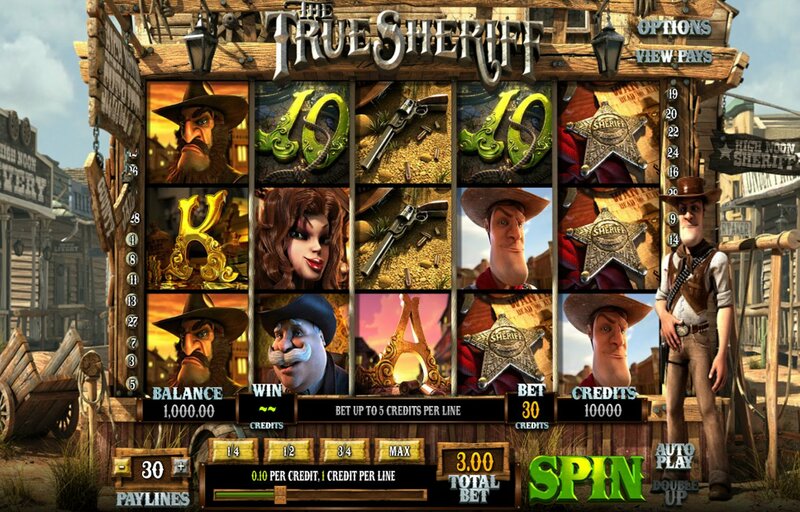 There's also a free spins round, triggered by three or more Sheriff Badge icons anywhere on the reels. You'll win anything from 10 free spins (for three Scatters) to 15 free spins (for hitting five Scatters). There's no re-trigger for free spins so overall it's a pretty average bonus round. If you've ever played Play N' Go's excellent Western-themed slot, Gunslinger, you'll know what makes a cracking game with touches of the Clint Eastwoods. Hunt this out for some typical Betsoft greatness.